We’ve had the privilege of working with Daniel and crew from Satchel & Page on several occasions now. We have reviewed their Bomber Jacket and Mailbag – both of which proved to be stellar pieces. And, we’ll be publishing a review of their Café Racer Jacket in the coming months too (along with some other yet to be announced pieces). Based in Austin, TX Satchel & Page is dedicated to producing handmade, high quality leather products for you to enjoy and pass on to generations to come. They launched their business on Kickstarter with a few iconic bag designs: the Mailbag, Map Case, Gladstone, Briefcase, and Pilot’s Bag and have been expanding their product line with exciting designs – both new and well established. Over the course of six months, Satchel & Page tested natural vegetable tanned hides from 4 different suppliers. For production, they chose hides originating from within the USA, which aged with the richest patina. And, they are only using the Bend portion of each hide for their belts to ensure consistency in thickness through and through. 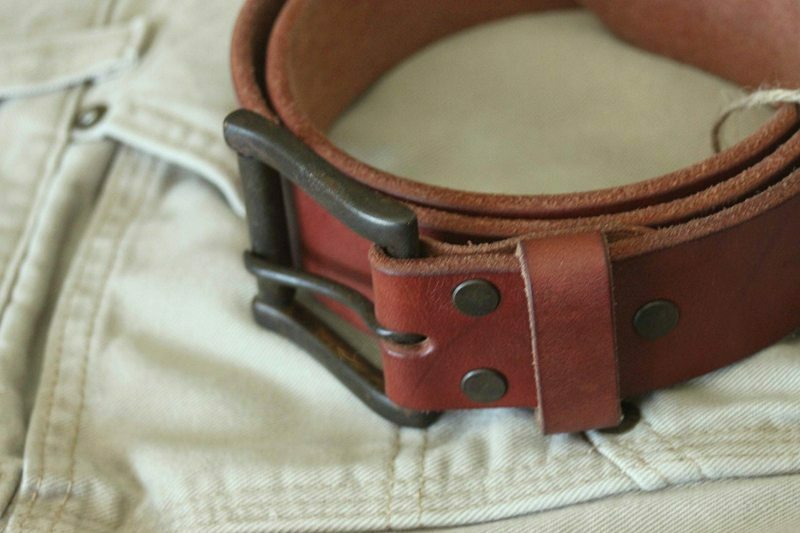 The Belt is comprised of 10-12 ounce full grain, vegetable tanned leather. They’re thick! The hardware is military grade brass buckles and Chicago screws. Satchel & Page is using Chicago screws because unlike stitching, snap buttons, or rapid rivets to attach the buckle, Chicago screws will never break. And you can also unscrew them and easily swap out the buckle if you wish. In addition to the antique brass and silver matte finishes, they have developed two finishes that are hand aged by their team of craftsmen – Iron Rust and Copper Patina. Due to short notice, we were only able to get a small version of the belt and consequently have not actually worn it (it’s too small for my no-petite-at-all-frame). But, the Belt has made the rounds at home, in the office, and amongst several team members here at BestLeather. Everyone’s initial reaction and assessment has been overwhelmingly positive. “Thick leather”, “gorgeous hardware”, “I like the tapered tip of the belt”, “nice, robust belt keeper loop”, “subtle logo placement”, and more are the words I’ve heard spoken about the Belt. I have no doubt that this belt will perform its role superbly and admirably all while looking fantastic. And, since it’s vegetable tanned leather, it will get better looking as it ages and is used. 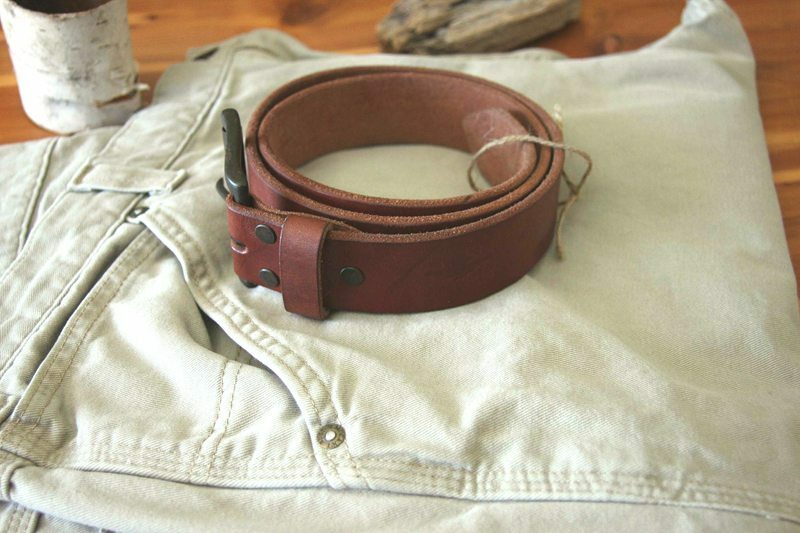 The Belt from Satchel & Page is no doubt a Buy It for Life piece. The quality of the leather coupled with the superior hardware ensures that you’ll be using this belt for a long, long time. Their Kickstarter has about 8 days left on it. They’ve blown past their goal, which is no surprise. There are still plenty of rewards and incentives left and you can still get this belt at the Kickstarter price of just $62 (will be $95 post-Kickstarter). The best option? Spend $275 to get all four belts with all four hardware options. Then you’ll truly “rule” in the belt kingdom.